In heavy industry and manufacturing applications, it is often critical that parts be marked with letter and number characters or bar code symbols to convey information about them. Serial and part numbers marked in this matter can help both the manufacturer and the end user determine useful facts such as the date and place of production, as well as suitable replacement part numbers in the event of long term wear or damage. One of the most efficient and effective methods of marking these pieces of information onto a metal surface is known as inkjet marking. Inkjet marking is the industrial use of a dye or ink to imprint numbers, letters, lines, or patterns onto a surface and is the marking system of choice for applications where large amounts of text marking are required. Much like a common household printer, inkjet marking stations use computer controlled jets of ink to create these markings. The spray of ink may be continual or intermittent, depending on the process being used by a given inkjet marking system. These two types of systems are denoted as CIJ (continuous ink jet) and DoD (drop on demand) systems, respectively. This type of marking is excellent for marking numbers or barcodes that will not wipe or easily wear off onto surfaces. However, it should be noted that these markings will not hold up to being painted or subjected to industrial abrasion. 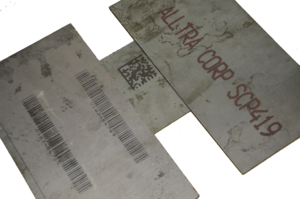 ALLtra Corporation's particular inkjet marking stations combine versatile and customizable features with precise computer controls for automation of the marking process. These stations are perfect for quickly and efficiently marking large quantities of text or barcode information. ALLtra inkjet marking stations offer excellent solutions for industrial manufacturers who require effective marking performed by machines specially designed for heavy duty usage. Both DoD and CIJ systems are available, and bar code support is included. If you need efficient inkjet marking systems for your manufacturing facility, please contact us to set an appointment with a sales representative or call us at 918-534-5100 to discuss your requirements.